Walk to the beach! 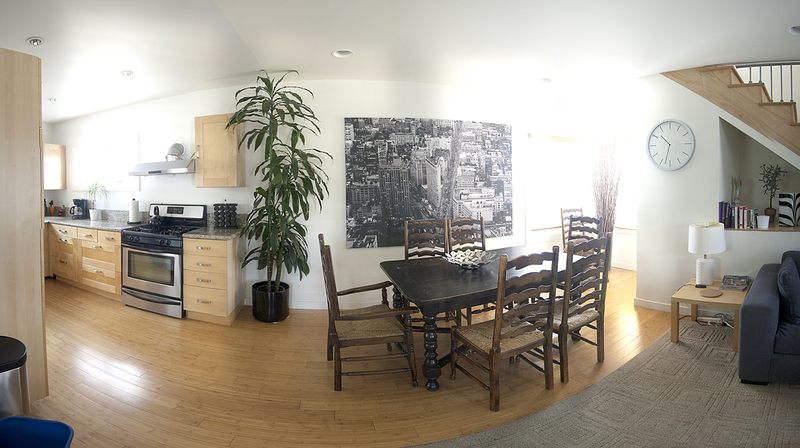 Close to the border of Santa Monica in Venice Beach, Very nice three-level (lots of stairs) beach guest house that is just one block from the sand. 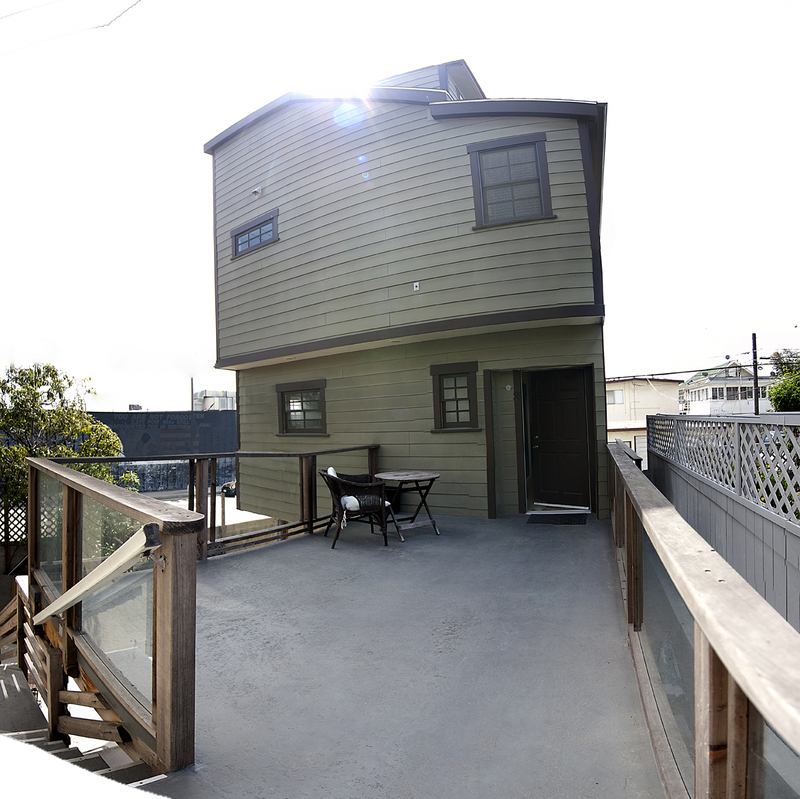 This house is located in the busiest, action packed area of Venice. An extremely bohemian and eclectic community. This is a corner house so very convenient to public transportation. 3 bedrooms: 1 king bed, 2 queen beds, air beds and a pack n play crib also available. 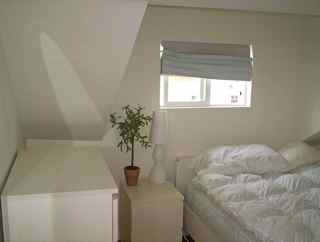 One of the bedrooms is very very small and is on the 3rd floor. 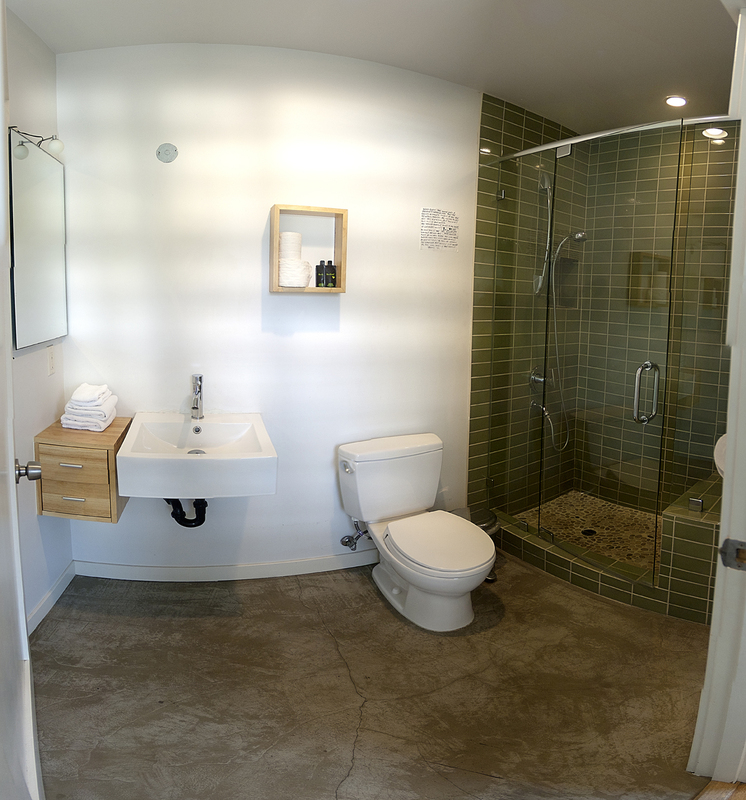 2 bathrooms: 1 shower / tub, and 1 stand in shower. 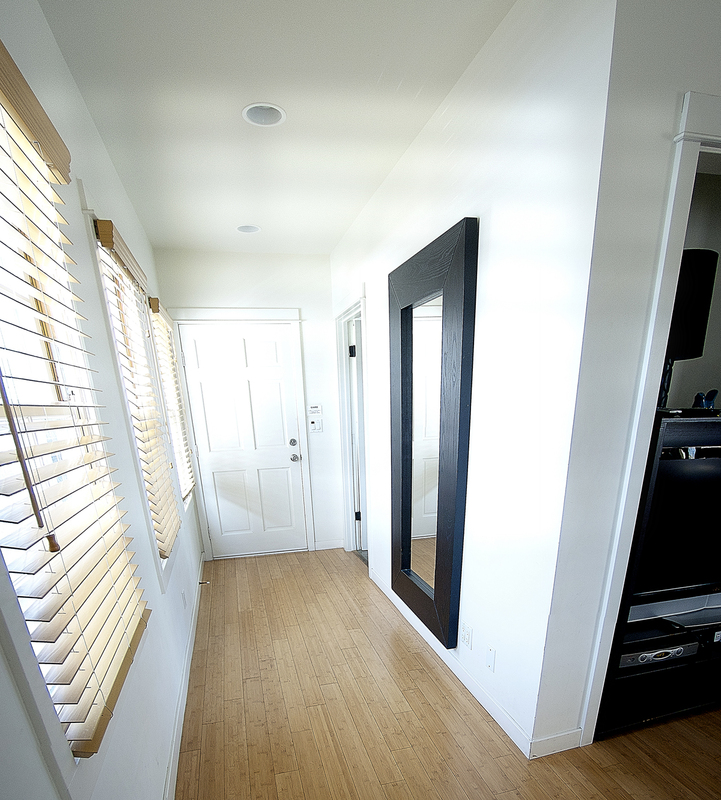 You will find throughout the house hardwood bamboo flooring and ceilings with recessed lighting. The large open first floor has a living room with a comfortable seating area, 42″ flat screen TV and a dining area that seats 6. 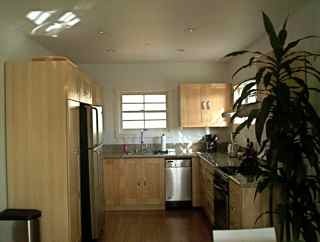 The kitchen has all stainless steel appliances, including a large refrigerator and everything else you could possibly need. The decor is clean and basic, nothing very fancy.. The main bedroom has a comfortable King size bed, the 2nd bedroom has a comfortable Queen size bed and a private balcony. 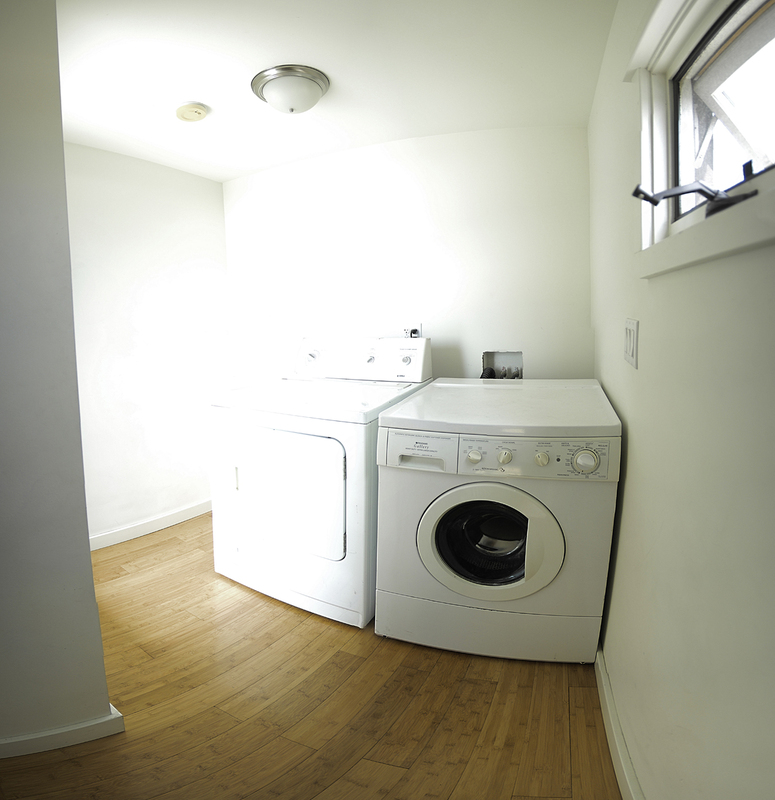 Both have 32″ flat screen TVs and walk-in closets. 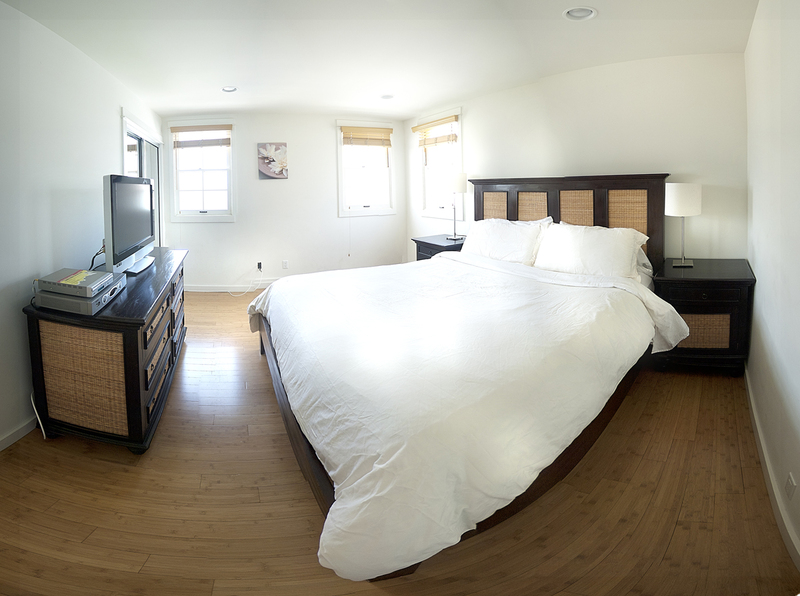 The third bedroom is a much smaller room with a queen bed. 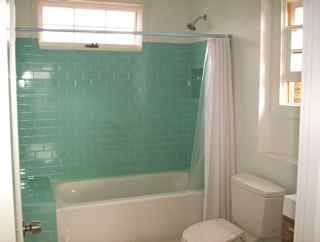 Both bathrooms have contemporary updated tile and vanities and the 2nd floor bathroom has a full sized tub and shower. Two parking spaces are included inside a garage / carport. 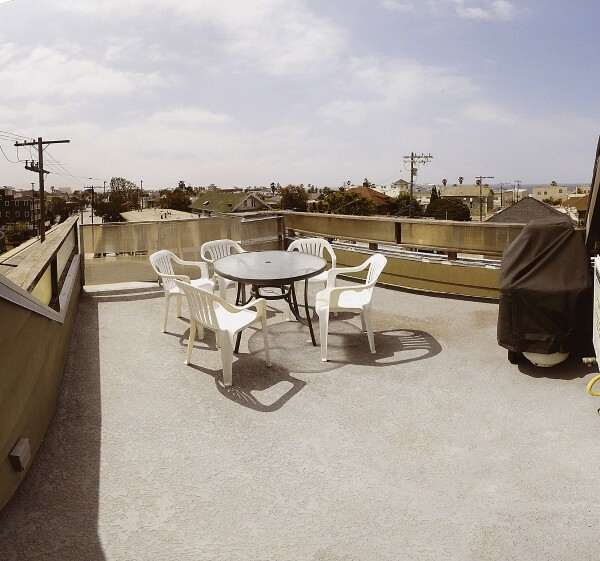 The top floor of the house has a laundry room with a washer and dryer, and a large roof deck with spectacular views of the ocean to the west and the downtown L.A. skyline and San Gabriel mountains to the east. This vacation home comes with DishTV that includes the premium package with HBO & Showtime, and many other movie channels and free high speed wireless Internet access. $6500 to $8500 per month. Summer and holidays are the higher rates. $750 refundable security for week long stays. Rates are based on a 4 person stay. 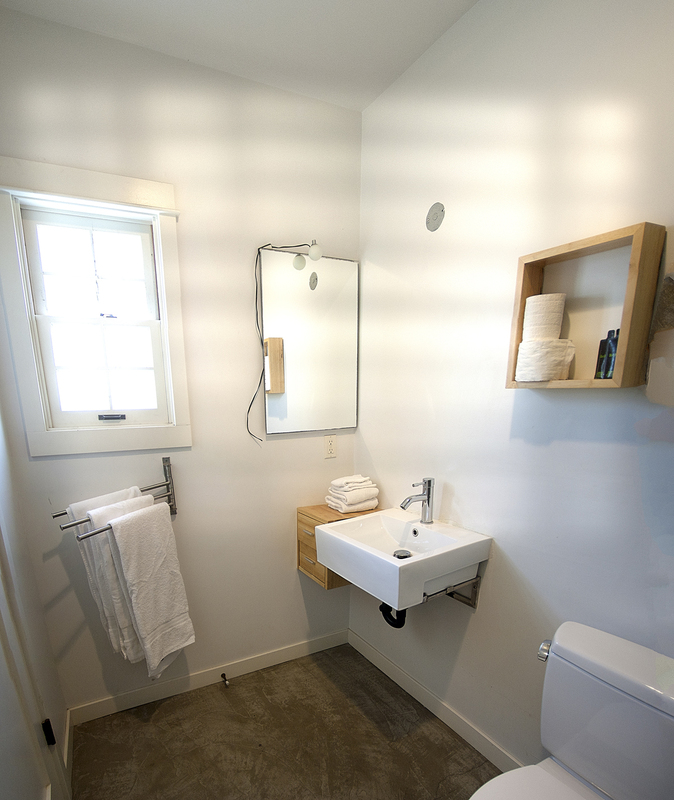 Additional guest are charged $25 each per night. This is a great house for a party of 6! Location is just perfect, house is somewhat noisy. Wonderful location, quiet spacious home. 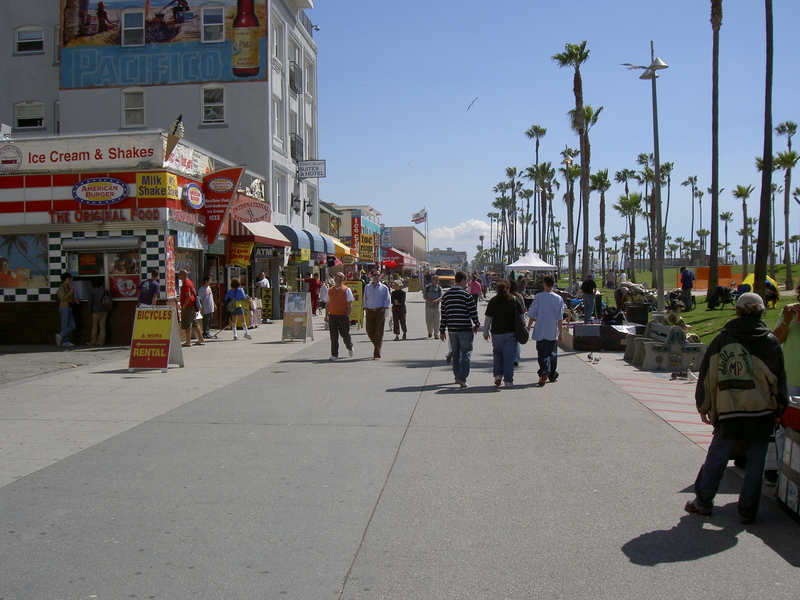 Close to the beach and boardwalk. Coffee and shops close by. We had a wonderful stay. The locations is unbeatable — steps from the beach and in the heart of Venice. 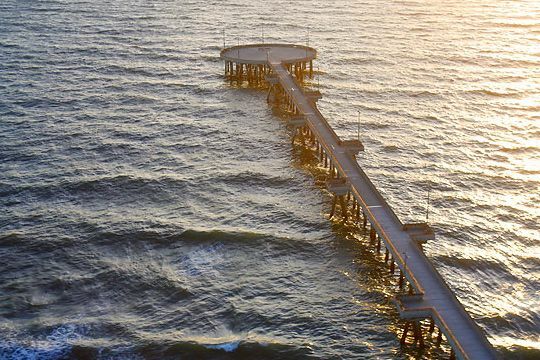 Beautiful views of the ocean and sunset on the house’s roof deck. Spacious house. Nice restaurants nearby. 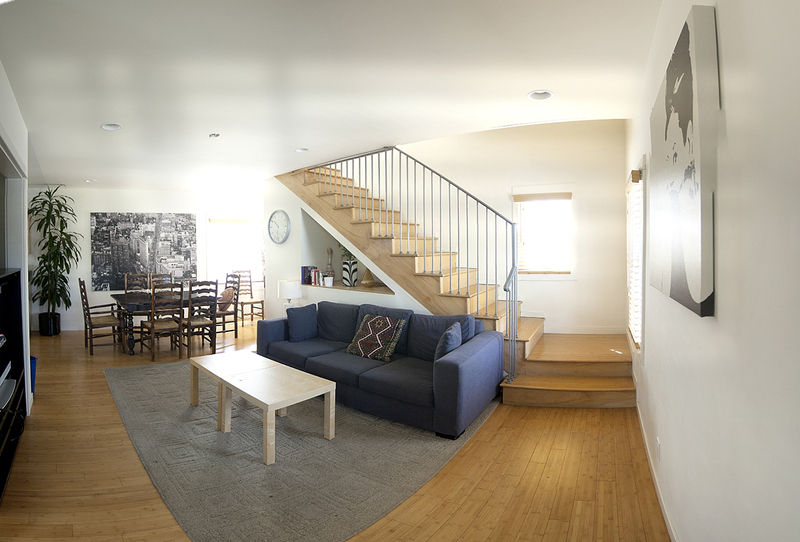 Lovely Apartment – exactly like the pictures! 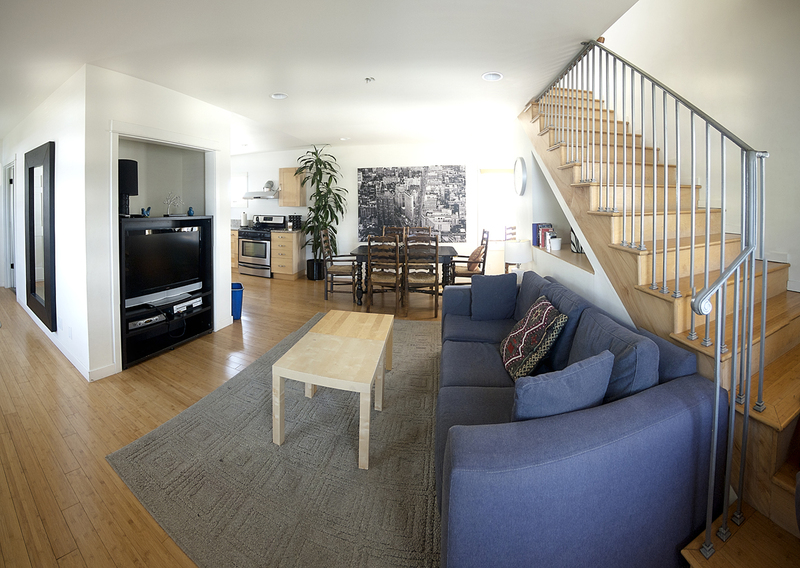 Absolutely fantastic location for getting to Venice, Santa Monica, Abbot Kinney & Main Street. 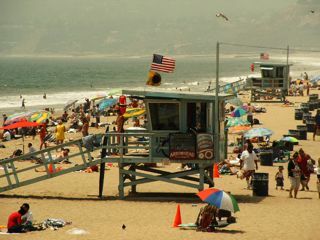 Very accessible to lots of other area’s in the LA area. 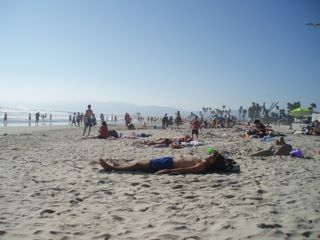 The beach is also about 1 minute away. Mike was also really helpful throughout. Good contact with the renter, on time with information. We rented the house for 3 bedroom use. 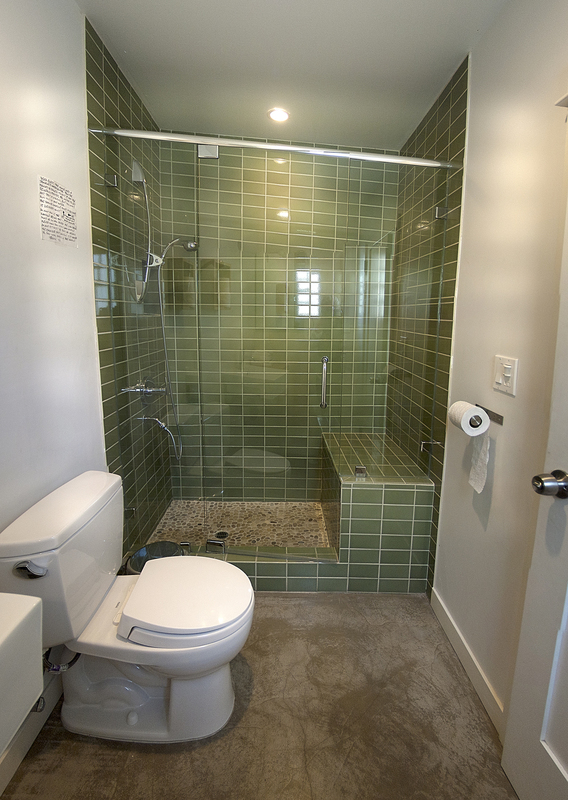 2 of the 3 bedrooms were great, the 3rd one is a small, warm, small space on the top of the house for this 3rd bedroom the bathroom is one floor down. The whole house is nicely done with very good kitchen. great location, nice place, comfortable, and very clean. and the place is very family friendly, though it can be a great chance for a group of quiet travelers. 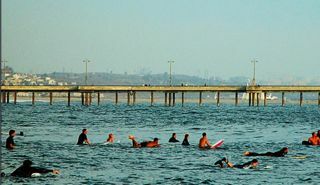 One block away from the beach, walking distance to Main, Abbot Kinney, Windward or maybe Washington Blvd: all different choices for entertainment and food. What a great house, in a wonderful location. We came to LA to work, there were 3 of us staying in the house. It was perfect, big enough for us all to work and relax in. So much nicer than staying in a hotel for a month. The canals and surrounding area is perfect, shops and restaurants within walking distance. The house is in fantastic condition, well stocked and full of character. 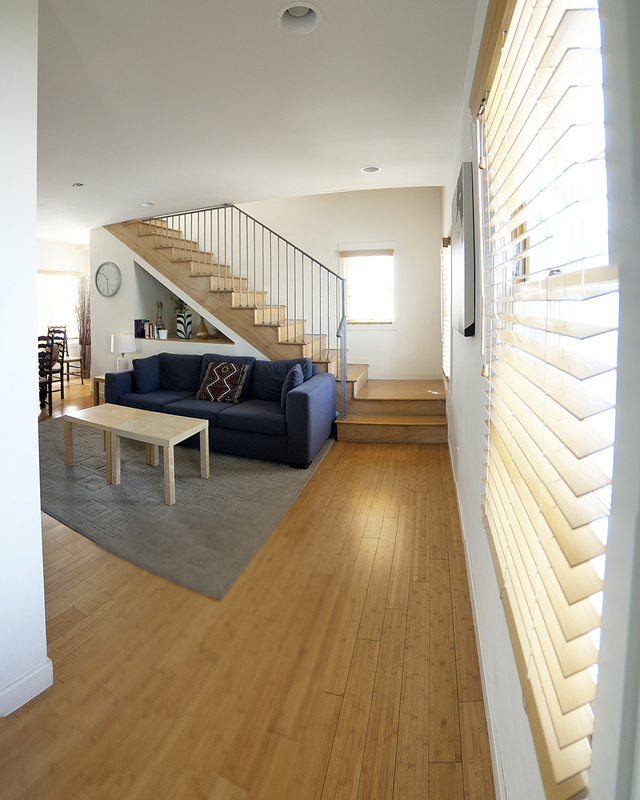 It was spotlessly clean upon arrival and kept that way by the cleaner (and us!). Highly recommended.